Connect to nature year round. Beautiful to look at, living walls increase your general sense of well-being. They produce fresh oxygen and absorb sound. Studies show that having plants in the home and office is associated with decreased stress levels, and an increase in productivity and creativity. Adding greenery to your home is easier than you think. Increase oxygen levels and reduce stress. Vertical walls are the perfect solution for homes with limited space, pets and small children. Warm up your work space! We love working with businesses to help add greenery to a space with no project being too large or small. Vertical walls are a low maintenance way to achieve a lush, green pop of colour while also saving precious floor space. Fill out the form below to set up a consultation and let us wow you the possibilities! 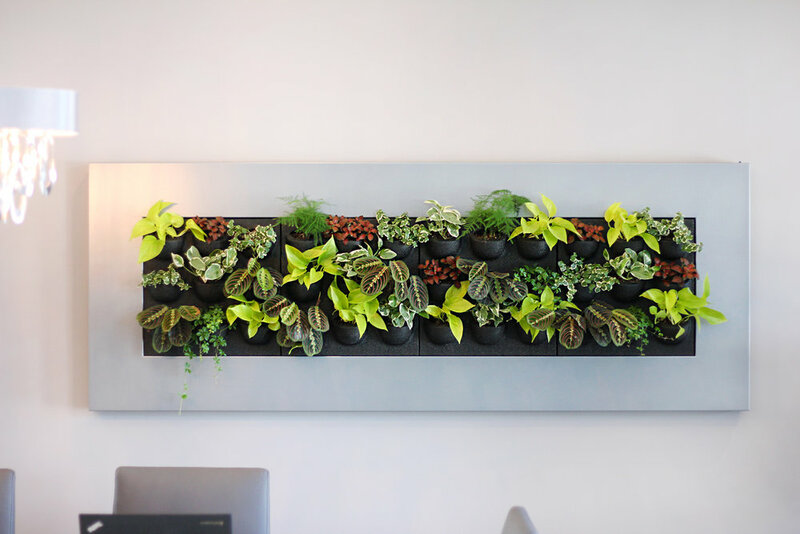 We provide living wall design customized to any space. From instalation to maintenance we strive to make sure your plants thrive in their new environment. With an onsite consult we will assess the light, humidity and design aesthetic in your space. We'll discuss your lifestyle and how much time you'd like to invest in caring for your wall and then provide you with mock-ups and quote options best suited to your needs. Book a Consultation * We charge a $50 non-refundable consult fee. During the consultation we measure the light in your space, discuss your needs, budget and snap some photos of your space. We then provide you with mock-ups and quotes. Yes, please email me available appointment dates. Is there natural light in the space? Thank-you for your interest in our living walls! Kindly allow up to 72 hours for us to respond to your inquiry.